For A Professional Roofing Company, Contact Us At Roofworx Today! Having trouble with leaks or storm damage to roof? Roofing systems are susceptible to leaks whether due to weathering or being improperly installed. If your home needs repairs, we are the roof repair experts you need. Call us today 817-920-5974 to learn more about our residential roof repairs in Fort Worth and Dallas, TX. Storm damage is a common cause for roof repairs. Strong wind can blow debris into your roof, creating dents or breaks in the material. The debris can get caught on top of a roof creating areas for moisture to pool and seep into the system if it was damaged in the process. Have your home inspected after a storm blows through. Leaving damage too long could eventually lead to needing a replacement. Call Roofworx today to have your roof inspected and repaired! 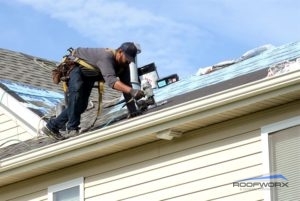 In the event of an improper initial installation, a roof repair can result in certain parts of the current roofing structure to be torn off to eliminate any moisture that has pooled and gathered within the base. With proper, professional roof repairs from Roofworx, you can prolong your roof and keep the structure of your space intact. Your home’s roof is vital to you and your familiy, make sure you get the best repairs to ensure its longevity. Ready to get started? Call us today 817-920-5974 to learn more about our exceptional roof repairs in Fort Worth and Dallas, TX. Updated on February 11, 2018 at 7:35 am by Roofworx & General Contracting.